While two of my children gagged their way through dinner, the other one couldn’t get the second, third, fourth slice in fast enough. 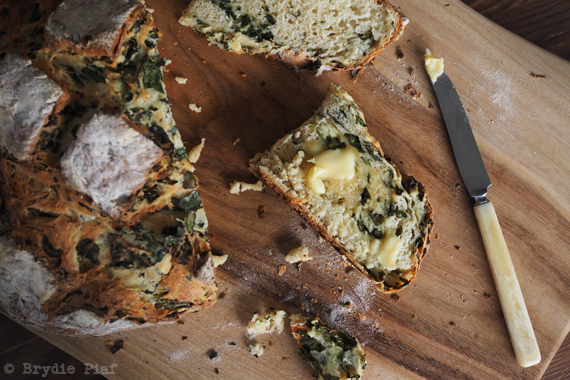 The problem and in equal measures, the highlight of the bread, was the spinach. Spinach is one of those vegetables that seem to be hated by many and adored by all others. I think spinach is delicious and and will happily eat it in any form given to me. In a bread, you’ve got the benefit of a vegetable hidden (or not so much) in a high carbohydrate baked good, where you can’t go wrong really. So while I showered my spinach eating child in heart eyes, deep seated love and adoration, I loaded up his plate with slice after slice of green infused bread goodness. I ignored my other two who continued to gag their way through the meal, feigning food poisoning, swallowing inability and general parental wickedness at even placing such a thing on our family table. I instead focussed on the crusty sided outside of the loaf. The soft inner crumb, the subtle taste of the spinach and fetta infused throughout and the slappings of cultured butter to bring it all together. As sunk my teeth in, I mumbled that I might make another one tomorrow. Predictably this was met with a one sided cheer and two tragic noisy wails worthy of oscar nominations…luckily for me I’m well practised at ignoring misguided spinach wails. In a large bowl mix through your yeast, flour and water, with a spoon then cover bowl and leave for 20 minutes. Then add salt, spinach and fetta, turn dough out on to bench and knead dough until it comes together. It’s a bit of a messy one with the spinach and fetta, but the dough will start to feel smooth and more elastic. Pop the dough back in to the mixing bowl and cover for about an hour or until roughly doubled in size. Fold the dough over once, and then proof again. Dough out on to the bench and gently shape into a round, laying it on a baking tray. Rub a little extra flour on the top and leave to proof again until roughly doubly in size. Score the dough just before it goes in the oven and bake with steam at 230C. 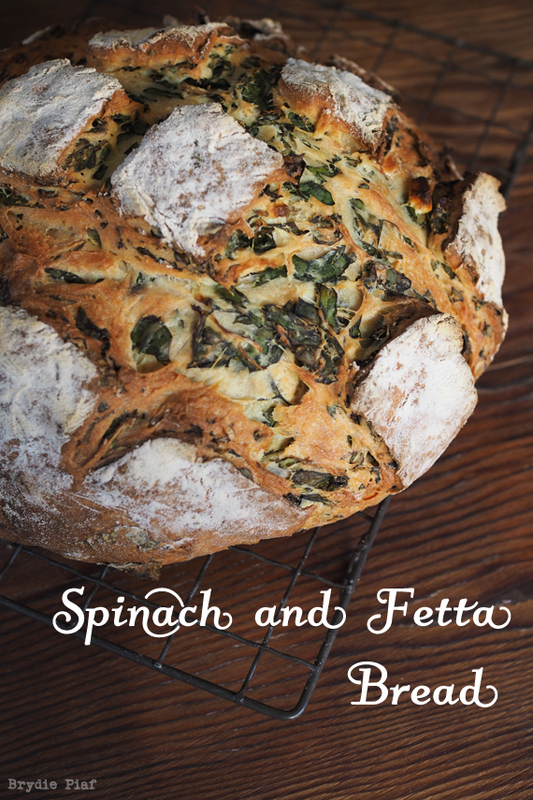 This entry was posted in Baking Bread, Food Glorious Food, Making, Creating + Frugal Living and tagged easy bread, fetta, lunch box ideas, rainbow chard, spinach and fetta bread by cityhippyfarmgirl. Bookmark the permalink. I am so giving that a go! YUM!! 2 out of 3 of my children would devour that, the other I’m not so sure…maybe lashings of butter on it would convince him! yep, hiding under lashings of butter is always a good start. I tried that too…they just licked the butter off. 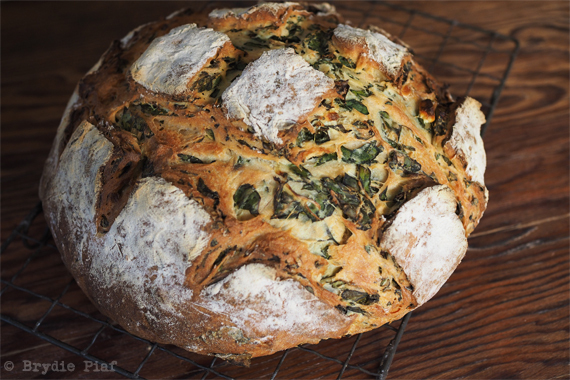 When you make a gluten free person absolutely desperate to make bread on a Sunday morning because the story and the recipe go together like peaches and cream (or spinach and feta )….you know you have done something right. Those 2 cheeky monkeys crack me up. Lucky you have a little spinach eating Popeye. The only way I can get mine to eat spinach is in cheese and spinach pie so this bread would be a hit. Perfect picnic fare too. Yep it certainly would be a good picnic one Zena. Note to self, must picnic more! Jane what’s with the green? And why is one green vegetable ok, and another equally green so not ok? And then how does it all change again and suddenly all greens are ok? So many vegetable questions…it’s a mystery isn’t it. Oh my….. drooling plus plus. This gluten free gal would face a week of pain to tast that!! Looks fabulous. They keep you on your toes don’t they! Yep, I can see the same thing would happen with my daughter … But it sounds DEEEElicious! Problem is, I’d probably end up eating the whole loaf myself. Maybe I’ll wait for an occasion where I know there would be other takers as well. YUM! Maybe make bread rolls and freeze them? Or the one big loaf, slice it and freeze it. My two un eating imps I’m sure actually did like it, it’s just darn colour…it messes with their heads. It’s all good Ms Narf. Mostly I just choose my battles. The night before had been been sausage rolls filled with cauliflower and mushrooms…actually I’m surprised you didn’t hear my wicked laugh all the way down in Tasmania after all through had scoffed a tray load of them. I do like the your idea though for the colour alone, that would look gorgeous! Spinach and feta cheese belong together! I eat mine piled on glorious pizza, but now will bake these into bread. Thank you for the idea and recipe!! Ha ha ha!!! I love that idea Karen. AND, if I was to have a separate toilet for my 4.5 year old, I could leave that to go green and see if she starts howling at the greenness on that. I bet there wouldn’t be any complaints there. It would probably be over-looked!!! I LOVE spinach, but ABHOR silver beet (and there is a difference)! Looks delicious. I have one spinach loving child and one that tolerates it to be polite so I’m definitely going to give this a try. Delectable, delicious, wonderful, awesome …….. and I can go on and on. Love, love, love it. Thanks for sharing from your newest follower.